We Have Reached Peak Subscriptions! RUSH: By the way, you want to hear something? I have to share this with you ’cause if I don’t, nobody else will. We have reached peak subscribers at RushLimbaugh.com. We’re into our 30th year, 29th year, whatever it is; we have more subscribers for RushLimbaugh.com and The Limbaugh Letter than we’ve ever had. Now, you would think the peak would have been way back years ago when we just opened this stuff and made it available and the initial rush of subscribers based on interest would have happened then. But it’s the same thing with the audience. Since the Trump election, the audience here is continuing to grow. Normally after elections, audiences trail off a little bit. Not this show so much, but traditionally in the business. Elections draw people that listen only at that time of the year and then they go back and do something else. We’re holding them. It’s almost like a second version or a rebirth with what is happening with subscribers at the website and the app. I mean, people are downloading the app out the wazoo as well. And it is a great app. 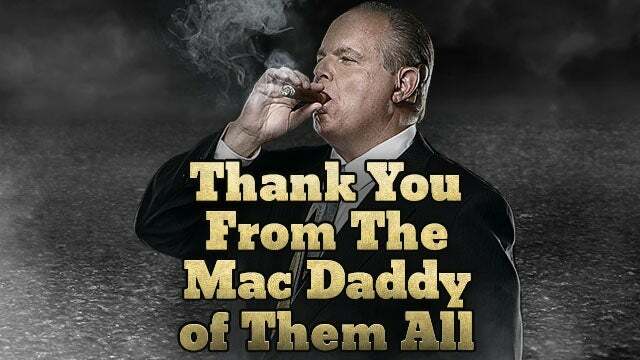 And podcasts that are available each and every day after the program is over that you can listen to in that format if you wish, all accessible from the RushLimbaugh.com app either in iPhone or Android. But it’s just gratifying, folks, and I just wanted to say thanks and take a brief moment to let you know that you are all part of this at peak EIB. Isn’t that amazing? Peak EIB in the 29th year.